We knew that September was going to be busy with harvest time and preserving, but it seems that the page turning on the calendar has caused both leaves and temperatures to drop as Autumn is ushered in. Last year, we were really pleased to have supported our local Reskilling Day arranged by Ealing Transition. Based in the vicarage garden at St Mary’s Church, Jono Paynter and I introduced the residents of West London to the joys of animal husbandry in your own back yard. 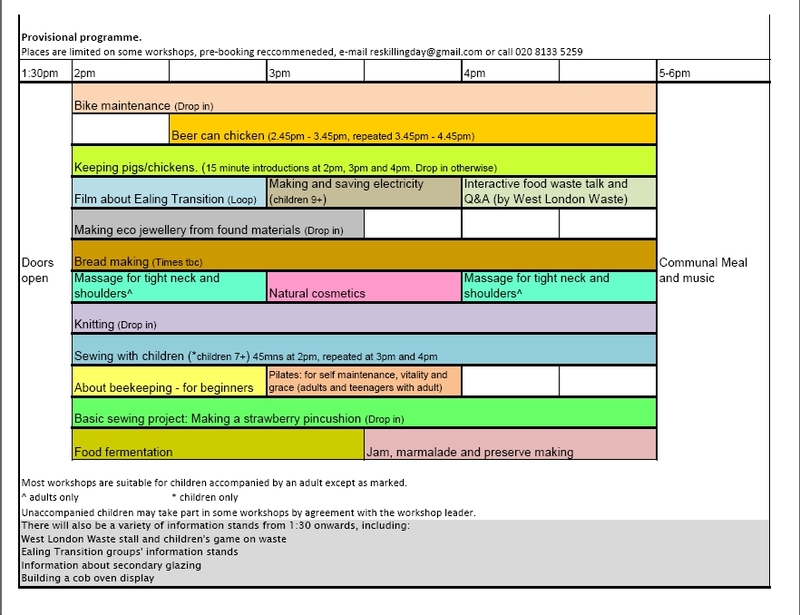 It’s been a pleasure to have been invited back for this year, and whilst there are a number of activities available throughout the afternoon, Jono and I will be cuddling chickens, patting pigs and talking through the responsibilities of rearing livestock in West London. So be it beekeeping, knitting, or jam come and be inspired to learn a new skill, for more information, see the workshop programme here. With Summer behind us, many of our courses have come to an end. It’s too cold to open up the beehives and too dark for our evening Urban Hens. However, we have planned a whole year’s worth of courses which can be seen here starting with Family Feathers and Fun on Saturday 9th November. Young Skylar, pictured here, came on our last family course because she had brought home a chick that she’d hatched at school! This course is a great opportunity to see how chickens could fit in with your family at home; we explain the responsibilities whilst the children, and grown ups, hug the hens and create some crafts. We always finish up with tea and cakes! This beautiful book is just the thing for planning all your harvest preserves and thinking ahead for home-made Christmas presents. This was jolly handy when we had a glut of cucumbers to pickle recently, the combination of Dorling Kindersley for a stunning publication and the Soil Association for organic endorsement makes for a comprehensive manual that will inspire you to try it’s tips, techniques and recipes. It’s Honey Show-Time, with the London Show last week and the National Honey Show at the end of the month, will we win any prizes this year?